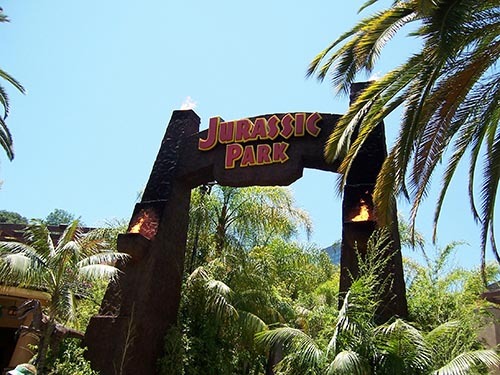 Steven Spielberg managed to not mess up Michael Crichton’s brilliant novel Jurassic Park. Vampire Academy: Released February 7, based on the best-selling novel of the same name, this movie garnered an abysmal 10% on rottentomatoes. It also only grossed $15 million worldwide against a $30 million budget. Endless Love: Released February 14, adapted from a well-received novel by Scott Spencer, scored a 15% and a mere $20 million in box office returns. Winter’s Tale: Also released on Valentine’s Day, this movie was based on the novel of the same name—a novel which had received significant praise upon publication. In the process of making the movie, however, the book’s strengths failed to come through. The movie was panned and made only half of its budget back. We’ll admit that adapting a book for film is certainly a difficult task. There will always be aficionados of the books who will find fault with the movie. There will always be film critics who won’t like how the novel’s words, characters or story translate to the big screen. That being said, it is not impossible to turn out a great movie adaptation of a book. Just take a look at our favorites and you’ll see that a book can be faithfully and effectively adapted for cinema. 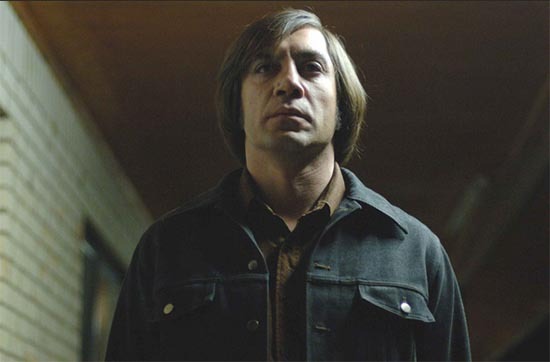 Javier Bardem won the Academy Award for Best Supporting Actor for his portrayal of No Country for Old Men’s villain Anton Chigurh. The Coen Brothers adapted Cormac McCarthy’s 2005 neo-Western novel into an equally bleak and arguably better-than-source-material movie. Winning Best Picture of 2007, No Country for Old Men made a masterpiece out of one of McCarthy’s lesser quality works. Don’t get us wrong: the book is solid, but when compared to The Road or Blood Meridian, it’s just okay. The source material for this 1997 film—James Ellroy’s 496 page novel—is not just long, but extremely dense. In order to cut his manuscript down, instead of removing plot lines or characters, Ellroy removed every unnecessary word from every sentence, creating a unique style of prose. With such a daunting task ahead of them, it would seem director Curtis Hanson and screenwriter Brian Helgeland were destined to turn out a lesser adaptation. 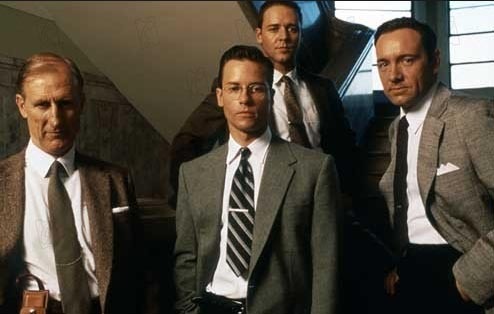 Instead, their film garnered them 9 Academy Award nominations, a few wins, and really invigorated the careers of Kevin Spacey, Russell Crowe and Guy Pearce. Four officers in the L.A.P.D. that each go about solving a murder their own way in L.A. Confidential. One of the most controversial films upon release, Kubrick’s adaptation of Anthony Burgess’s 1962 novella proved to be a classic in waiting. At the time, the film divided critics, but still managed to get a Best Picture nomination in the end. Over the years, however, critical reviews have shifted from divided to nearly universal praise. Kubrick’s films tend to be ahead of their time. A Clockwork Orange has become more relevant, according to some, due to its portrayal of violence as a glorified act, something that the media today all too often does. Marlon Brando, already well-known, earned his second Best Actor award for the Godfather. The newcomer, Al Pacino, would receive a nomination for supporting role. 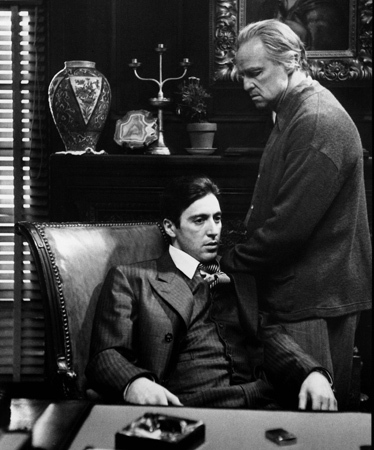 The Godfather launched Pacino’s career. Mario Puzo’s novel is definitely great. It was one of the first best selling, if not original, novels about the Italian Mafia. Puzo’s book was more as a pulp/crime story than literature. When the novel became a success, Hollywood became interested. A number of directors were contacted, but many were busy with other projects. Finally, after Francis Ford Coppola‘s ideas for the adaptation, Paramount gave it the greenlight. Working with Puzo on the screenplay, Coppola created a work of art. Work a stunning cast including Marlon Brando, Al Pacino, James Caan, Robert Duvall, John Cazale, and Diane Keaton, the Godfather transcended Puzo’s source material. It has become not just the definitive mob movie, but one of the greatest films of all time. We bet that the producers at the time had no idea how iconic and timeless Die Hard would become. A lot of people don’t know that this late 80s action flick was based on a pulpy, thriller novel from 1979. Written by Roderick Thorpe, Nothing Lasts Forever follows retired NYPD Detective Joe Leland as he visits his daughter on Christmas Eve in Los Angeles. She works for Klaxon Oil Corporation in a 40 story building, which comes under siege by German terrorists. Like in the film, Leland (a.k.a. McClane) runs around barefoot, assisted by an LAPD Sergeant, taking out terrorists. The book, however, ends darkly with Leland most likely succumbing to his wounds. 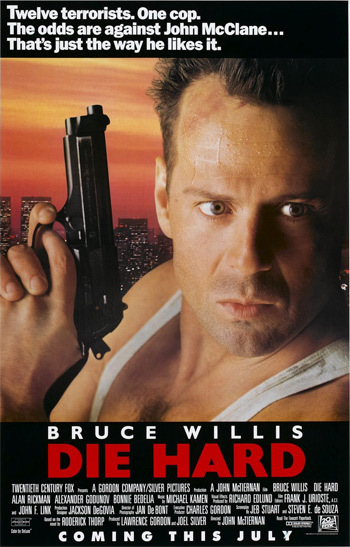 The movie, however, sees Bruce Willis and Alan Rickman go head-to-head, attempting to outwit the other though by using very different methods. Both are fantastic in their roles, elevating the movie to something for than just a shoot-em up. Last Friday the spy movie Jack Ryan: Shadow Recruit came out. With it’s January release date, it seemed like it wasn’t going to be an earth shattering piece of film. And the verdict on rottentomatoes seems to confirm this: “It doesn’t reinvent the action-thriller wheel, but Jack Ryan: Shadow Recruit offers a sleek, reasonably diverting reboot for a long-dormant franchise.” With a 60%, it’s just passable as a movie to see. But it got us thinking about…what are the best spy films? And what does best mean? By critical consensus or by box office receipts? We decided to sort of mix the two criteria with our own subjective favorites. 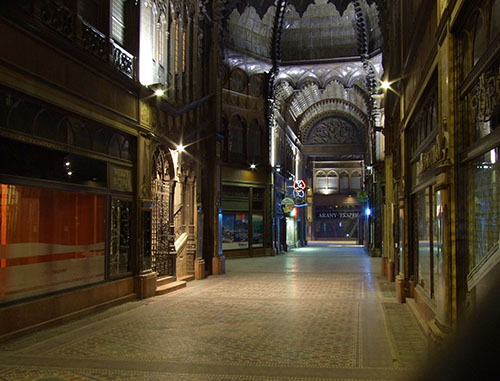 The Párizsi Udvar in Budapest, the setting for the opening scene that sets the plot in motion. Some critics and viewers complained that this film is slow. The pace is better described as deliberate. Real spycraft is a gradual, steady game of either spinning a web of deception or cornering your opponent. In the case of le Carre’s Tinker Tailor Soldier Spy, it’s a superbly crafted mole hunt for the traitor inside “the Circus” a.k.a. MI6. Rather than explosive actions and personalities, this movie was about Gary Oldman’s quiet, resourceful and cunning George Smiley using deduction and reason, instead of gadgets and car chases, to defeat the enemy. Shrouded in muted, drab colors and set in a gray early 1970s London, the film’s look evokes the moral ambiguity of espionage as personnel and assets are thrown out once their use is gone. Really a great recent spy film—and excellent book. 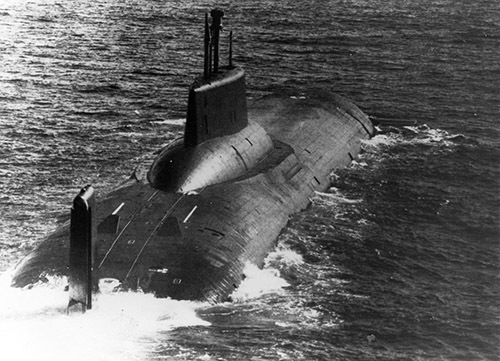 The Red October is the name of the Soviet Typhoon-class submarine that has gone missing. Red October is an allusion to the Bolshevik Revolution that took place in October 1917. This movie’s actually more of an action/thriller than spy film, but since its central character is Jack Ryan, a CIA analyst, we consider it an espionage movie. The plot concerns a Lithuanian naval captain, played by Sean Connery, who’s dissatisfied with the U.S.S.R. and decides to defect to the Americans. When he attempts to do so, the entire Soviet navy is sent after him while the U.S. navy—believing that this renegade Soviet commander is actually a madman about to start a nuclear war—also hunt him. Only Jack Ryan, played by Alec Baldwin before he got into comedy, believes that Captain Marko Ramius is defecting. The film has great characters, settings, military and technological aspects, and stands up well to the test of time. Nothing about it seems dated. An underrated spy thriller, Body of Lies may at times be a little hard to follow, but it’s easily one of the best movies about post-9/11 espionage and al-Qaeda. Leonardo DiCaprio is field agent Roger Ferris who jumps between the U.S., Iraq and Jordan trying to ensnare a terrorist leader named Al-Saleem. Russell Crowe plays his boss who routinely messes up Ferris’s field operations by running his own operations without informing his subordinate. British actor Mark Strong is the head of Jordan’s intelligence group, G.I.D., in a great performance that highlights the complexities of spycraft in the Middle East. It’s a dense, but smart plot that shows the complex nature of society and culture in Arab countries. 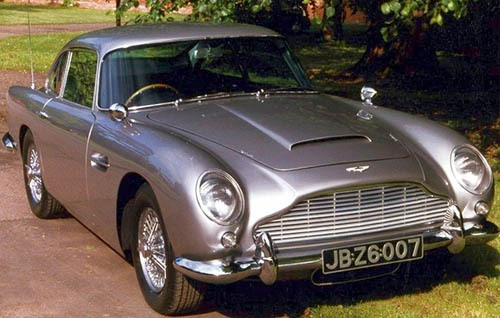 Goldfinger introduced the concept of the Bond car, equipped with all sorts of weapons and gadgetry. Critics and the cast may like From Russia with Love the most out of the early Bonds, Goldfinger is, however, the quintessential 007 movie. Hardly a realistic spy film, this Connery flick laid out the formula: it had the quirky gadgets, the pre-credit action sequence, the song played over the opening credits, uniformed henchmen, and so much more that all subsequent Bonds would borrow from. Before Bond hit the big screen, Hitchcock rolled out this impressive Cold War spy thriller. In probably the worst case of mistaken identity, Cary Grant’s Roger Thornhill is mistaken for a government agent by a group of foreign spies. It’s got some amazing scenes: Thornhill running through an open field as a plane tries to run him down, a chase across Mount Rushmore, and an iconic dramatic score to underpin it all. Eva Marie Saint is also excellent as the semi-femme fatale. 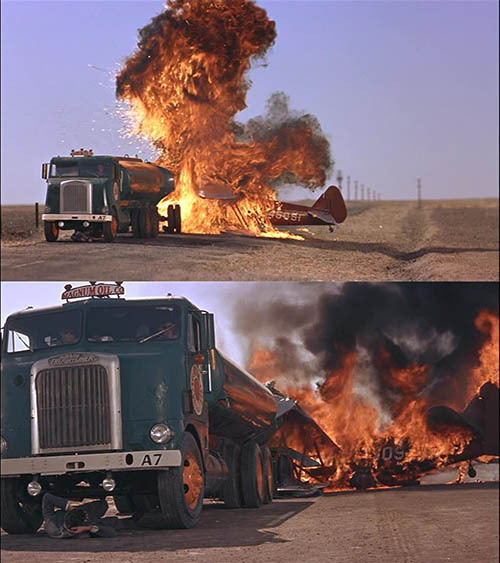 After Cary Grant evades a chasing plane, it crashes into an oil tanker. Just because the film’s from 1959 doesn’t mean it can’t have over-the-top explosions like modern films. Those are our choices, but it’s by no means definitive. There were a lot that we didn’t include for reasons of time. To name a few that we also love: Casino Royale, Three Days of the Condor, Eye of the Needle, The Spy Who Came in from the Cold, Munich, The Quiet American. We suggest you see them all. Suggested for dentists, dental assistants, and dental hygienists. But not for children. In a little under seven months from now, we will witness the centennial of the First World War. It’s a war that Americans have failed to connect with, for a number of reasons. One, we entered the conflict in its second-to-last year, and even then, our soldiers didn’t engage in significant action until 1918. Two, after the war, we disengaged from the outside world and became focused on domestic affairs, further distancing ourselves from the war’s effects. And three, it happened so long ago that no one involved is alive. It’s true that the First World War is no longer part of memory, only history. Still, it should be noted that, for all belligerents, the last surviving veterans passed away only a few years ago. In the U.K., the “Last Fighting Tommy,” Harry Patch died in 2009 and still vividly recalled his experience at the Third Battle of Ypres in 1917. For the US., Frank Buckles had served in the Army and drove ambulances. He died just three years ago. 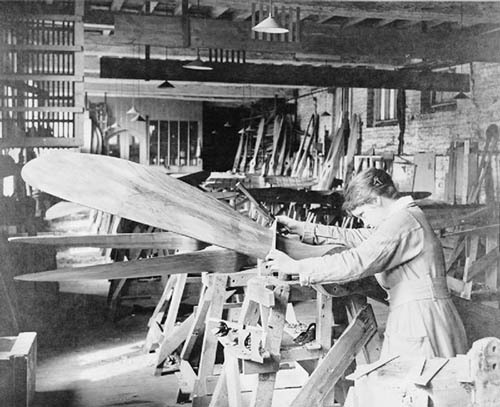 Where would feminism be if the First World War hadn’t put women into the workforce on a national scale? Therefore, on an individual level, we aren’t that far removed from the conflict. In terms of the war’s larger consequences—its effects on politics, international relations, governments, diplomacy, cultures—we aren’t removed at all. We exist in the world created by the First World War, in a way that people don’t fully appreciate. The national borders of today’s Middle East were drawn up by the Allied powers with little regard for local considerations. Both British and French diplomats had promised various Arab leaders support and independence as long as they fought with them against the Ottoman Empire. But the Allies were playing a cynical game. As they made these promises, they secretly concluded their own aims in the Sykes-Picot Treaty. This agreement split the entire Middle East between the British and French Empires. Some places would be directly controlled; others would fall under their respective “spheres of influence.” In 1917, the Bolsheviks—another direct product of the war—published this treaty for the whole world to see. Ever since, Arab nations have, rightfully so, looked upon the West with extreme caution and suspicion. The Cold War, though it’s now been over for more than two decades, was born out of the Bolshevik Revolution in Russia. Traditionally, Americans think of the Cold War as starting after World War II, but an argument can be easily made that it really began in 1917. The war gave birth to the world’s first communist state. Ever since, every communist movement couldn’t help but compare itself to the Soviets. Today’s generation doesn’t appreciate how much, on a day-to-day basis, the Cold War shaped our country’s actions. It’s legacy still casts shadows over regions that used to be part of the Soviet Union. Just look at Belarus and Ukraine’s continuing struggle with authoritarianism. They may not be communist, but they’re hardly democratic. Another area of former Soviet republics embroiled in conflict is the Caucasus, notably Chechnya, whose push for independence in 1991 was denied. The Second World War saw greater total numbers of casualties, yet many forget that countries like Britain, France and, too often, forgotten Italy lost far more in the First. Those people who do know a little about the First World War tend to see it as a struggle in futility. They take the view that popular post-war works like All Quiet on the Western Front put forth, that it was a pointless conflict with little meaning besides mass death. This is view shaped by hindsight. Unlike those in the immediate aftermath, we know about the rise of Nazism, of the Second World War, and of the Cold War. The fact that it wasn’t “the war to end all wars” has made us see the leaders at the time as naive and has left us with profound cynicism. Yet that was not the feeling at the time. When the war ended, there was dancing in the streets as would be seen on V-E and V-J day in 1945. 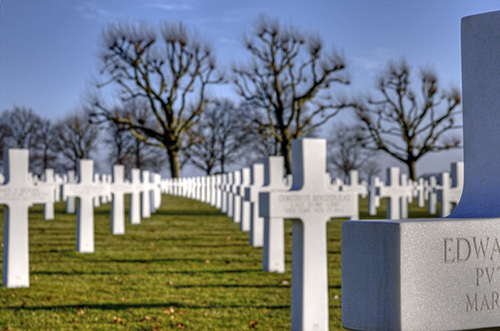 Those who fought truly believed that it was a war that had to be fought (especially among the French) and that the war did have a deep meaning. For the ideologues, the war was seen as liberal democracy versus authoritarian militarism. For non-ideologues, it was a war to liberate their land and fellow countrymen: France, Belgium, Serbia, as well as all those countries of Eastern Europe that would come into eventually come into existence like Poland. One could go on for much longer about the war’s both broad and deep effects still felt today. Many nowadays still look fondly to the pre-1914 years as a lost paradise, much like people in the interwar years did. It was a time of unprecedented globalization, a level of which we wouldn’t see again until long after World War II. Europe was the center of a world that people assumed could only get better. Like many today, people of that era dismissed the idea of a war between Great Powers as impossible: they were too integrated with each other, they had too much in common, and too much to lose if a conflict came. Besides, they reasoned, it had been nearly 100 years since the last ‘Great War’ (Napoleon’s defeat in 1815). They were proved horribly wrong. We’ve made it 69 years. Let’s hope we can surpass their record. This blog is sponsored by America’s Dental Bookstore – for all your dental books. When it comes to books, all we sell are dental books. That said, books are very dear to us, books of all shapes, sizes, subjects, and genre. Recently a friend asked for advice when it came to finding an engrossing and scholarly but accessible general history book. This question really got me thinking and as a result, a list of suggestions was drawn up. William McNeill’s The Pursuit of Power: Dense, yes, but important, truly. Spanning roughly a 1000 years (actually more because the first chapter summarizes ancient societies), McNeill traces the path by which the West—namely Europe and then the U.S.—became the dominant military power on the globe. Though Eastern powers, notably China, have nearly caught up, McNeill shows in his book that Western societies possessed unique qualities that contributed to their precocious military developments since the Middle Ages. His main argument: commercial transformation in society forced militaries to respond to market forces in ways previously unseen. This may make the book sound like a purely military history book, but it’s not. McNeill covers vast amounts territory including the technological, social, cultural, economic, and psychological causes and effects of Europe’s military development. Really an incredible synthesis of history, with plenty of footnotes. 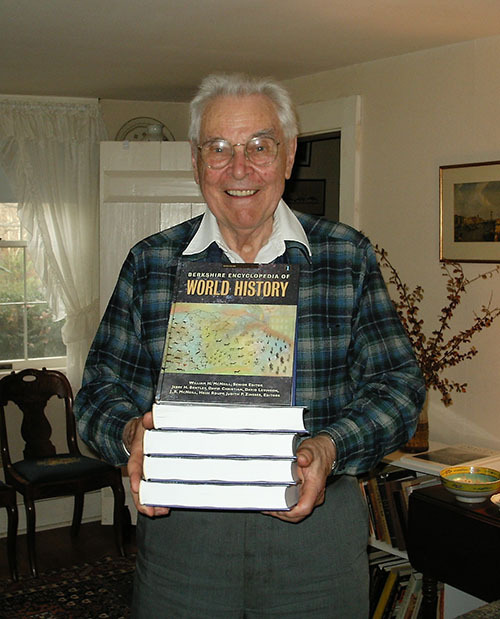 Professor William H. McNeill with a number of his books. All his books are great, but another especially fantastic one is Plagues and People. Jared Diamond’s Guns, Germs, and Steel: We’re not biased towards Western history, but this volume on why/how the West came to dominate the world is too fascinating to be left out of this list. Diamond has an interesting background for writing a history book. He has degrees in physiology and biophysics. This, however, makes his approach in this title most interesting. Rather than arguing the old view that the West’s superior intelligence led to their dominance, Diamond starts at the beginning of civilization. 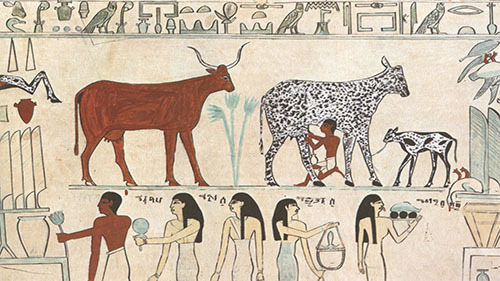 He outlines how geography, diet, climate, linguistics, human biology, and animal domestication all profoundly shaped the development of society. Of course, it doesn’t answer all questions and critics have said that much of it is derivative (sometimes compared to McNeill’s book above). Still, it is more than worth your time to read. Without the domestication of animals during the Neolithic Revolution, there’s little chance humans would’ve invented the wheel. Without an obedient draught animal, how would carts be pulled? Mark Kurlansky’s Salt: a World History: It’s rather courageous to write a world history book based around one commodity. Some charge that this book is gimmicky or overly emphatic, but it’s still a riveting read nonetheless. Kurlansky begins his whirlwind global journey in China, and then moves to Egypt then Greece, Rome, and beyond. We take for granted that around a century ago modern chemistry and geology revealed how prevalent salt was on the earth. Until then it was one of the most sought-after commodities. It has played a significant role in human survival—most notably as a way to preserve meat. It has led to wars and political upheaval—e.g. Gandhi’s salt march. Indeed without a correct balance of salt in our blood, we would die. Stephen Kinzer’s All the Shah’s Men: While not a general history, this is suggested because Americans really need to understand why Iran “dislikes” us. In 1953, the democratically elected Prime Minister of Iran, Mohammad Mosaddegh, was removed by an American C.I.A. orchestrated coup d’etat in an operation called Ajax. The reason: Mosaddegh nationalized Iran’s oil to the detriment of Britain’s, and our, interests. Since the early 20th century, Britain had controlled the oil fields of Iran through the Anglo-Persian Oil Company (where BP, British Petroleum comes from). Without this company, Britain’s supply of oil would be severely reduced. Hence the coup, the reign of the shah, and the dissatisfaction that would eventually cause the 1979 Revolution, a hostage crisis, and subsequent poor relations with the West.